While we rarely hear of avian flu infected wild birds out of China (likely due to less than robust surveillance & reporting) – over the past decade we’ve seen numerous reports out of Hong Kong (see Egrets, They’ve Had A Few . . . and Hong Kong: Two H5 Positive Gulls Found) of sick or dead migratory birds with the H5N1 virus. In December of 2008 Hong Kong saw their first outbreak of H5N1 in domesticated poultry in nearly 6 years. In early 2009 it was announced that the H5N1 outbreak was `likely’ caused by infected migratory birds. See Wild Birds Eyed As Likely Source Of Hong Kong Bird Flu Outbreak. Up until the past couple of years, the H5N1 virus has been the primary concern, but with the recent expansion of H5 and H7 viruses in Chinese poultry and the recent arrivals of H5N8 in Taiwan and Japan, H5N1 is now far from the only threat. Last week is was reported that a Peregrine falcon tested positive for H5 virus in Hong Kong, and that further tests were underway to determine the subtype. Today we learn that this bird was infected - not with H5N1 – but with the recently emerged H5N6 virus. A spokesman for the Agriculture, Fisheries and Conservation Department (AFCD) said today (April 16) that the carcass of a peregrine falcon found at a construction site on Hung Yuen Road, Hung Shui Kiu, Yuen Long on April 9 was confirmed to be H5N6-positive after a series of laboratory tests. It is the first case of H5N6 virus found in a wild bird in the territory. The AFCD will closely monitor the situation. H5N6 is one of several HPAI H5 reassortants that have appeared in China over the past couple of years (others include H5N8, H5N2, H5N3, H5N5), and like its more famous H5N1 cousin – H5N6 has demonstrated the ability to infect humans. Although we only first heard about H5N6 a year ago (see (see Sichuan China: 1st Known Human Infection With H5N6 Avian Flu), it has since been reported across large swaths of China and as far south as central Vietnam. Last October, in China: H5 AI Rising, we looked at 24 recently reported outbreaks of H5N6 across China. 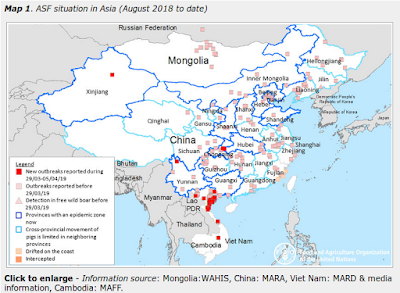 The following month, in FAO-EMPRES Report On The Emergence And Threat Of H5N6, we looked at an analysis of H5N6, and other recently emerged avian flu viruses in China. Since then, two more human cases have been reported see China Reports 3rd H5N6 Case (Fatal) – Yunnan Province), of which only one survived. Although it has not spread as well or as far as the recently emerged H5N8 virus (and its reassortant progenies), H5N6 is nonetheless a virus to watch.